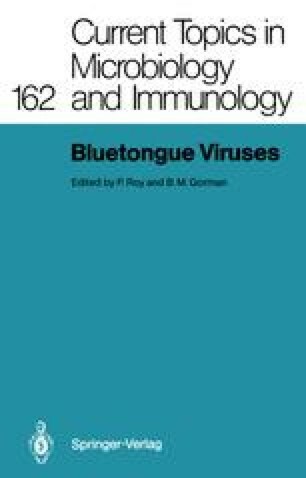 The structural components of bluetongue virus (BTV), the prototype of the orbivirus genus, has been the subject of a number of reviews (Verwoerd et al. 1979; Gorman and Taylor 1985; Spence et al. 1984). The main features can be summarized as follows: BTV is an icosahedral-shaped particle consisting of a segmented double-stranded RNA genome encapsidated in a double-layered protein coat. Removal of the outer protein layer activates a viral-associated RNA polymerase which transcribes the ten genome segments into 10 mRNAs which are in turn translated into at least seven structural and three nonstructural proteins. The characteristic features of these different structural components will be reviewed in this chapter. The key to the elucidation of the structural characteristics has been the ability to isolate and purify large amounts of BTV.